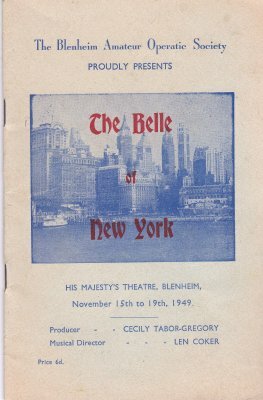 Abstract The Blenheim Amateur Operatic Society (Incorporated) proudly presents The Belle of the New York at His Majesty's Theatre, Blenheim November 15-19, 1949. There are several copies of this programme, one has M.H. written on the front and a note by Allen Hale inside, but I have actually kept a cleaner version with no donor information on it (Jenny Pierson, 22 September 2012). The Hale note has been put in this programme and reads, "Packed buses rewarded the operatic society for their efforts", signed A.M.H.